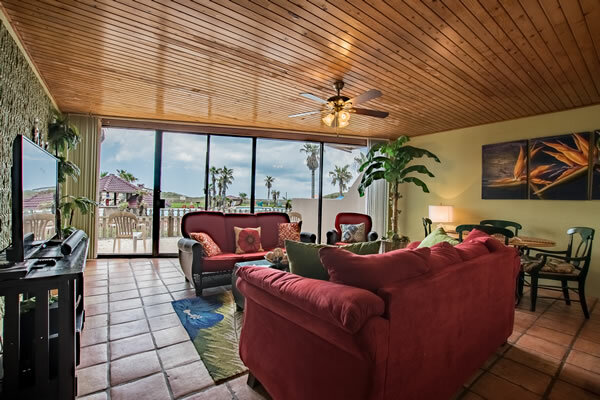 One Bedroom Condos – Sleeps 4: Our one bedroom condos are located on the first and second floors. 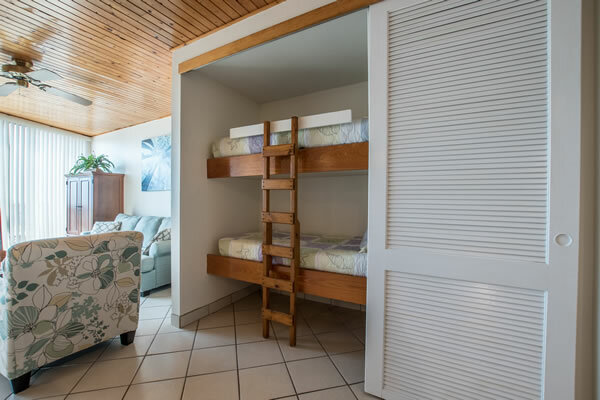 All have a king-size bed in the master suite and bunk beds in the main living area. Some condos also have a foldout sofa sleeper as well. 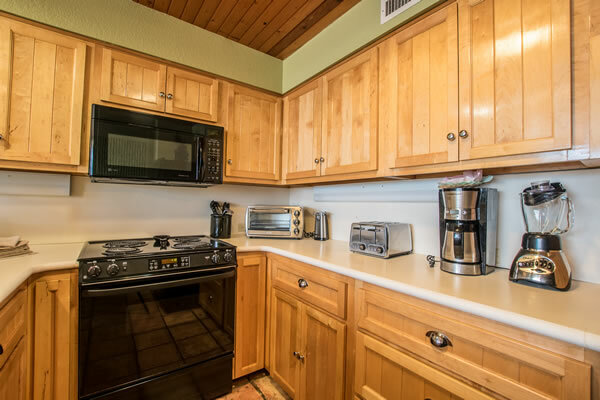 All one-bedroom condos feature an open concept floor plan in the main living area, kitchen and dining area and a single bathroom.The shower areas vary by unit. Some have a Jacuzzi tub, with a shower, while some have a walk-in shower. Details are on each condo’s page. 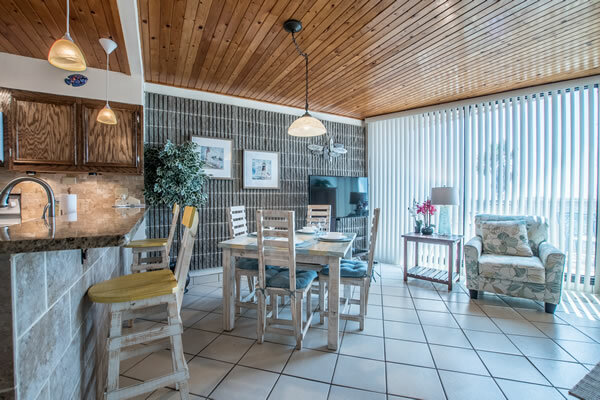 Ground level condos feature a spacious outdoor patio with pool and dune views, while second floor properties have a spacious deck with pool, dune and ocean views. 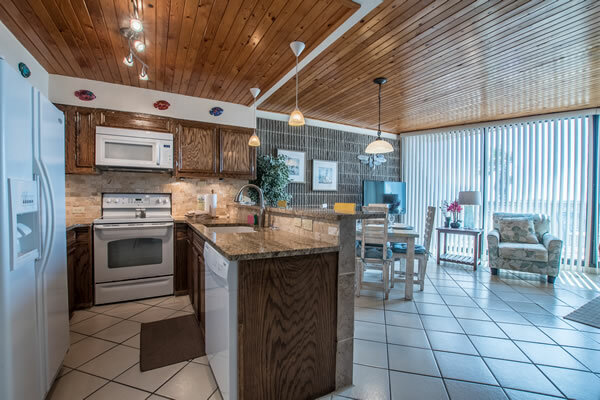 Two Bedroom Flat Condos – Sleeps 6: There is a limited supply of these unique condos on the first and second floors. Some have private, outdoor entrances. Most feature a king size bed in the master, a queen bed in the second bedroom and a fold-out sleeper in the main living area. All two-bedroom flats feature an open concept floor plan in the main living area, kitchen and dining area.The shower areas in the master suite vary by unit. Some have a Jacuzzi tub, with a shower, while some have a walk-in shower. Details are on each condo’s page. The second bathroom has standard tub and shower. 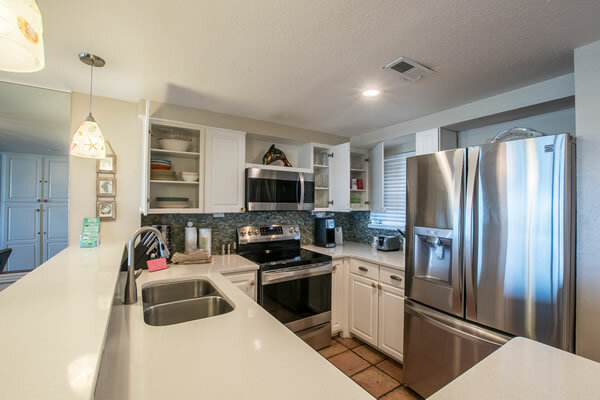 Two Bedroom Split-Level Condos – Sleeps 6: These unique, two-story floor plans are located on the third and fifth floors. The main living area, kitchen and a half-bath are located on the lower floor. 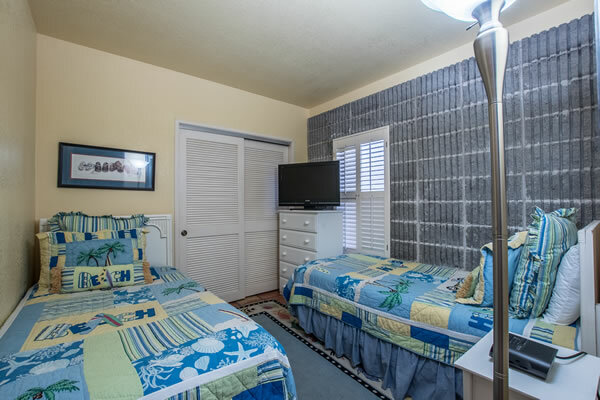 Both bedrooms are upstairs with each having it’s own attached bathroom. All two-bedroom splits feature an open concept floor plan in the main living area, kitchen and dining area.The shower areas in the both upstairs baths vary by unit. Some have a Jacuzzi tub, with a shower, while some have a walk-in shower and/or tub. Details are on each condo’s page. These condos feature 2 balconies. 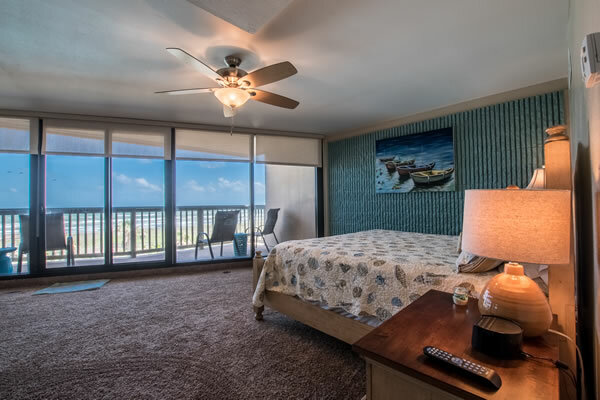 There is large balcony on the main floor and another, more private balcony off of the master suite, with pool, dune, ocean and beach views. Three Bedroom Penthouse – Sleeps 8: This one of kind, fifth floor penthouse is unique to The Mayan Princess, with 3 bedrooms. 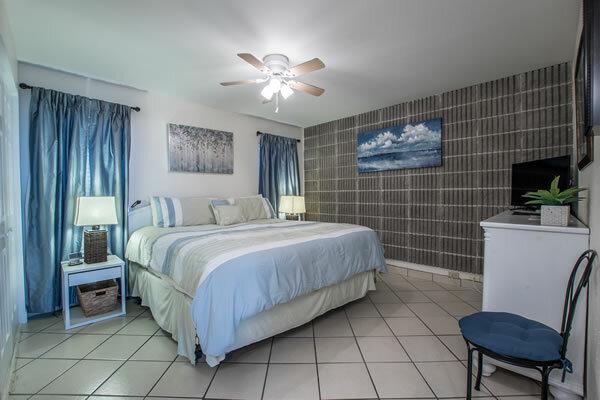 There is a king size bed in the master suite, a queen size bed in the second bedroom and twin beds in the third bedroom. There is a sofa sleeper in the main living area. All rooms are on one floor, which features an open concept floor plan in the main living area, kitchen and dining area. The master suite includes a spacious walk-in shower. 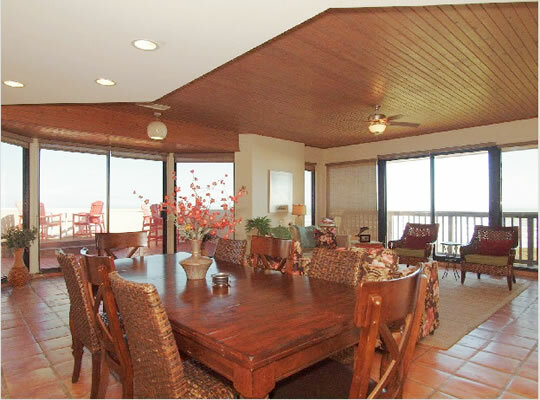 There is a massive balcony with views all around Mustang Island and the Gulf of Mexico.